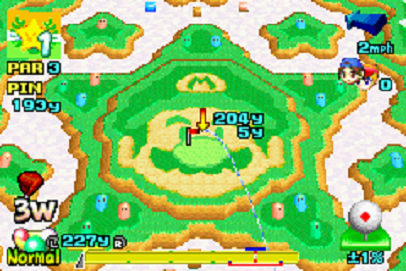 The 1999 Game Boy Color iteration of Mario Golf was tremendous; taking very modest hardware specs and chiselling out an absorbing, satisfying golfing experience with an unlikely quotient of depth. But when, five years later, its handheld successor arrived on the Advance, it was hard to shake the feeling that it hadn’t moved with the times. The intervening period had seen EA’s Tiger Woods juggernaut gain a grasp on the golf-sim market, whilst more unflattering still for MG were comparisons with the similar-in-spirit Everybody’s Golf (a series that was ironically developed by Camelot during its PSone days). Sony’s flagship had quietly been refined, instalment-by-instalment, leading to its own superlative portable landing in 2004, which made for a truly all-inclusive interpretation of the sport. 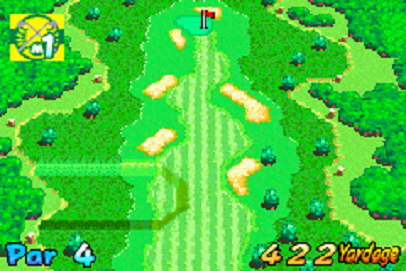 The trouble is that, whilst the aforementioned titles continued to evolve the look and feel of the modern golf game into the new millennium, Mario Golf: Advance Tour seemed steadfastly determined to play by 1999’s rules. It sticks very closely to the GBC version, and doesn't make much technical step forward either. As a consequence, MG:AT feels conservatively designed and, dare I say it, old-fashioned. What this means in real terms is a quality title that’s playable, has plenty of charm and is undoubtedly a labour of love for its developer, but feels too safe. It will all seem familiar to fans of earlier Mario Golf games, but then this means it carries with it old strengths; take for example the Story mode. 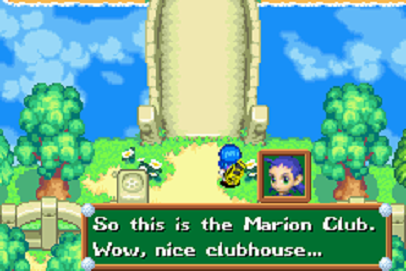 Here you take a player to the Marion Club gold academy, and battle up the ranks, improving your level as you go about tackling challenges, playing practice rounds and winning competitions, before ultimately heading to Peach’s Castle and taking on Nintendo’s flagship characters. Exploring the clubhouse, locker rooms and outside locations gifts MG:AT a nice role-playing element. 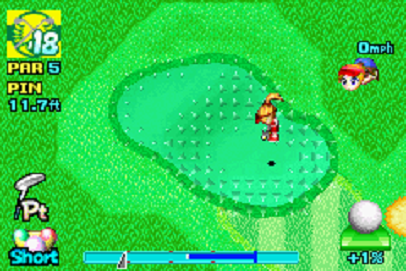 Nifty little gameplay quirks, such as the ball’s behaviour in wind, with spin, on certain surfaces, are revealed through intelligent dialogues with the golfers who populate such areas. It’s rewarding to see their comments regularly change whenever you reach new landmarks or succeed in competitions. Levelling-up your character is a pleasure as it means they can be tailored to certain characteristics, and there’s ample reward for practising and competing. Doubles is new to the GBA outing, whereby you take alternating shots alongside an A.I. colleague. It’s a nice idea, especially as you get to attribute ‘level-ups’ your partner too, although their inconsistent form is a source of ire. Often, they’ll begin a round playing almost flawlessly, before inexorably descending into a state of near-hopelessness, completely shanking even simple approach shots. In Match Play where every shot counts, this can be a real bother. 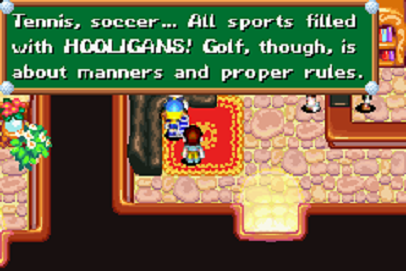 One guy rants about that famous 'hooligan' sport, tennis. Tee-shots and approaches are determined from a top-down perspective, and utilise the genre-standard two-button bar to determine power and accuracy. This makes for a nice, fluid system, even if the GBC version’s vertical lines were preferable because picking reference points seemed far more intuitive. The putting is simple enough to grasp with arrows indicating direction and the steepness of the gradient, though there isn’t much of a variance to the greens, and it’s surprising just how many putts that can be sunk without any altering of the aim. Executing chip shots of eight yards or less is unnecessarily cumbersome though, as the lower end of the power gauge provides far too much power. Courses look acceptable, despite the appearance of the squashed, Mode 7 3D graphic effect lending an uneasy reminder of the technical confines Camelot were working within. Nevertheless, Advance Tour’s visuals really come to life in the bubbly kingdom outside of the greens. Characters and environments pop with colour, bristling with plump, attractive cartoon visages. 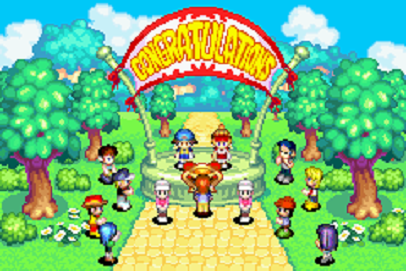 It’s presentation as a whole is brilliant too, with vibrant, easy to use menus and music that comes across as chirpy, clean-sounding and less tinny than many of its GBA contemporaries. Some may be a little disappointed that much of the game can be scythed through in a few short hours. It’s not that Advance Tour lacks for content – there’s plenty to do – it’s just short on challenge. I didn’t lose so much as a hole in Match Play until the fourth course, and it’s unlikely that any of the competitions will give you trouble until right near the end. It’s a shame, because it’s a regression from its predecessor in this respect, though there’s still merit in returning to try and beat course records, as well as a soundly-crafted multiplayer suite that extends its shelf-life. Mario Golf: Advance Tour is a pleasant, boisterous title, made by a developer that really gets golf. Five years is a long time to stand still in the video game industry however, and in many respects, it's actually a backwards step from its 1999 forebear. 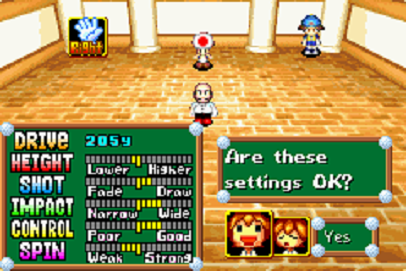 Technical limits hampered Camelot from coming up with something more adventurous perhaps, but excuses can’t ultimately cover for a title that, when peeking out from the GBA’s bubble, was being left to feel inexorably dated.